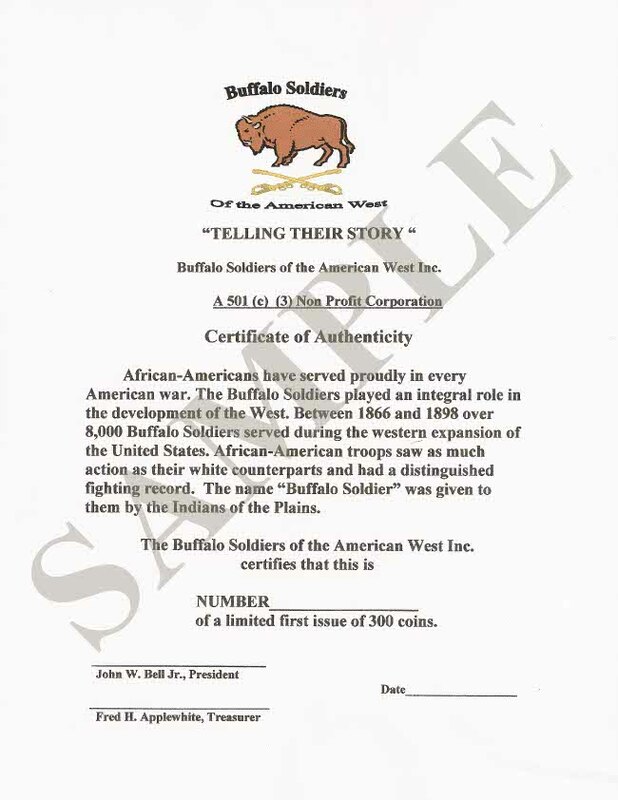 Here is a once in a lifetime opportunity to own a memento that honors the cavalry units of Buffalo Soldiers who served in the West during 1866 to 1944. Help us keep their stories alive. Buffalo Soldiers is proud to announce they are now selling Commemorative coins. Limited Edition of 300 Antique Silver coins depicting the Ninth and Tenth U.S. Cavalry of the Buffalo Soldiers. The coins are 2 inches (51mm) in diameter, two sides color with numbering. Each coin is sent with a Certificate of Authenticity in RF bags. Coins are $50.00 each, includes shipping & handling. Please allow 4 to 6 weeks for delivery. All sales are final.